ROARING SUCCESS . . . Aaron McEneff was awarded the 'man of the match' award for his contribution against Wexford in the FAI Cup quarterfinal. 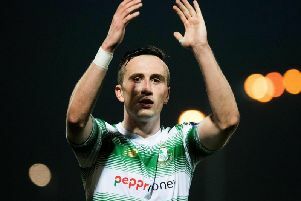 Aaron McEneff was in the stands at the old Landsdowne Road when Derry City defeated St Pat’s 4-3 to clinch the FAI Cup in 2006 in, what he claims, was the best football match he’s ever been at. And so the midfielder, who was awarded the ‘man of the match’ accolade in Wexford, needed little inspiration ahead of Friday night’s tricky FAI Cup quarter-final given the lure of a possible semi-final tie. However, McEneff revealed a DVD of the 2012 FAI Cup Final victory, shown by Derry City boss Kenny Shiels, acted as a perfect motivational tool for the Derry City players going into the game. The message from the manager was clear – defeat Wexford and become a step closer to writing another chapter in the club’s illustrious FAI Cup history. And the highlights of that 3-2 victory over St Pat’s clearly had the desired effect for the five-times champions as it served to pump up the City players, who are intent on a big day out at the end of the year at the Aviva Stadium. And although Friday’s match didn’t go as planned - as City fell behind to a sixth- minute Eric Molloy goal - the visitors rallied and produced a terrific fightback to avoid a shock exit and ensure they are in the hat for this morning’s semi-final draw. McEneff knows exactly what the competition means to fans of the ‘Candy Stripes’, having attended that dramatic 2006 final at Landsdowne Road when he was just 11 years old. Now, with Derry just 90 minutes away from reaching an 11th FAI Cup Final, McEneff is anxious to experience the occasion with his hometown club as a player. “It’s a big chance to get to the final and from my point of view it’s where you want to be and I’m sure all the other boys in the changing room are the same,” said the midfielder. “You want to be playing on the biggest stage and you want to be playing against the best teams on the big stage. That Final in 2006 at Landsdowne Road must have been the best game of football I’ve ever been at. “We watched a DVD last Thursday night of the boys when they won the Cup the last time at the Aviva and it really showed what it’s all about. He was instrumental in Derry’s quarter-final victory on Friday night and, not for the first time this season, McEneff had rattled the woodwork and his ferocious strike from a free-kick bounced back kindly for Lukas Schubert to net City’s second goal at the second time of asking in the second half. Although Barry McNamee put some well-earned gloss on the scoreline late on, that was the goal which effectively killed the game. And while he would have liked to get on the scoresheet himself, McEneff was delighted Derry got through a difficult quarter-final tie at Ferrycarrig Park, where a strong wind and incessant rain made it a hard slog at times. “Maybe I’ll need to miss-hit one for them to go in, but I’ll keep trying and they will go in eventually,” he laughed. “But I have created goals and as long as anyone is finishing them I don’t mind. “To be honest that’s the most important thing, as long as we win as a team I don’t care who scores. “We came down to do a job and we done it, we got the win so are into the last four of the cup,” he smiled. “I think to be honest I felt we started a bit slowly, all the boys would admit that. “They have a game plan, with a lot of long balls and stuff, they got their goal and credit to them in the first few minutes but we came back into the game and dominated possession and while we created chances, we probably should have created more chances - but we ended up getting our goals.